May be when we were children it was possible for us to love all unconditionally. But over the years as we get older, day by day there is a subtle change in us; keeping us away from friends/family members/in-laws/neighbors/church members/strangers who are not in tune with us. We make every effort to stay clear of further bonding. We drift aloof and indifferent from their company, which of course we can justify from every possible angle. But the question is: Are we okay in our relationship with God then? Let us look forward to rebuilding our relationships with one another, in Christ. Stay tuned. God bless you all! A quick reminder as we get ready to go worship the Lord today! Let's do it with gladness; and let's come before Him with joyful songs. Some of us may not be in a mood for joyful songs. Always remember when the burden gets heavy there is only one solace, the foot of the cross. The weary and burdened find rest at His presence as He refreshes the weary and satisfies the faint. Wishing everyone a refreshing worship! Come to me, all you who are weary and burdened, I will give you rest. Nowhere else we see such a direct call to go and lay down our burdens. I don't think no one else ever opened up such an invitation. Even we our self would not call out in a similar fashion to our family, friends or neighbors, for fear of adding to our burdens. As humans we are limited in our capacity to ease out other's weight. May be we will add to it like Job's friends did when he was suffering. Of course they thought they were helping him out but did they. Hardly. That's one reason why this invitation stands out in the crowd in a special way. Let us take heed and go to Him this morning with all our burdens and take the rest He offers in return! The rest comes naturally from knowing that He handles our cares. Isn't that awesome! The interesting thing about a fruit bearing plant is that the plant does not 'think' about producing fruits. It just comes naturally. Same way, in our lives, we do not 'have to work' to produce fruits. It will come naturally, if we remain in the True Vine. The sap within the branches that keeps the branch connected to the vine, can be compared to the Holy Spirit, who enables us to connect with Jesus one on one, on a continuous basis. When the sap runs dry, the branch starts to wither, and soon dies. Same way, when there is a decline in our experience of the Holy Spirit, when we don't thirst as much for the new infilling of the Holy Spirit on a continuous basis, our connection with Jesus will soon suffer. Remain in the Lord Jesus Christ.Do not let anything or anyone hinder your joy of salvation.Do not let any offshoots of false doctrine, take your focus away from the True Vine. Here's a complete list of the fruits that is expected of us, which we have discussed several times in our study. When we bear fruits, much fruits, it is ultimately for the Father's glory! Bearing fruits is the only way we believers can clearly distinguish ourselves from the rest of the world. Praise the Lord! And with that we end this series. Thank you for joining me every day for Coffee with Jesus. Have a blessed weekend! Yesterday we saw the importance of remaining in Him. Today's Scripture comes as a warning for those who do not remain in Him. Clearly it is a serious affair. But when we look around we can see many who do not heed to the warning. We can not do much about it, however we can all take a look within ourselves and see what we lack in terms of remaining in Him and correct ourselves. How strong we are in the Scriptures? How much of it do we understand? When was the last time we sat down with the Bible with an expectation of hearing from the Lord? Do we only hear Scriptures spoken from a pulpit or have we experienced the Scripture in works within us? Does the Word of God convict our inmost beings, bringing things to light, leading us to repent, and further more to shun from sin? If so, clearly you are in the right direction. Praise the Lord! If not, it is time to allow His words to work in us, thus enabling us to remain in Him. Praise the Lord! God bless you all. Happy Thursday! Hang in there; the series is almost over and so is the week. If we were to come across a watch on a beach our first assumption is someone owned it at sometime. If we go on indulging in further thoughts, we would assume someone bought it, someone sold it and ultimately someone made it at some time. In the case of a watch the watchmaker made it and then let it away independent of the maker. However in the case of us humans, our Maker, God the Father, not only made us but made us dependent on Him. Apart from Him we can do nothing. Every breath we breath is because of His grace. Many live as though they are 'watches let loose by their maker'. The root cause of all sin is the constant desire by us humans to become independent of God. We want to live our life our way. This can't be. We are mere branches. We need to be connected to the vine to be able to bear fruits. "Remain in me", says the Lord, "just as I remain in you". Do you notice the fairness of His command here? He is not asking us to do something He Himself does not do. Both parties remain in each other so that together they can bring forth fruits - much fruits. Praise the Lord! The fact of the matter is He always remains, we often waver. This morning let us refocus our attention to remaining in the Lord. For the rest of the day let our prayer be, "Help me to remain in you Lord, just as you remain in us, so that I can bear much fruit". God bless you. Enjoy the Wednesday! What does a gardener do? Of course he tends to the garden. He waters the plants. He enriches the soil with needed minerals. He fertilizes the ground. He removes the weeds among the plants. Gardener gets strict with the branches that do bear fruits. He prunes them so that they can bear much fruits. Whereas any branch that is no good for fruits, he cuts off only to be thrown away in the fire. Pruning involves removing any and all offshoots from the plants. Offshoots are little branches that drain the nutrients off the plant but produce no fruit. Pruning is painful yet not fatal. Cutting off on the other hand is beyond repair. He does that only when there is no sign of ever finding any fruits in them even after much toil. He cuts off the unfruitful branches with a heavy heart. Knowing how much our Gardener - Father God cares to see us fruitful, are we willing to let Him prune our offshoots? Our distractions? Are we willing to surrender to His care completely? Are we ready to acknowledge His supremacy over us? Those who are willing, say amen! Amen! Indeed our Lord Jesus Christ is the True Vine! Here's a beautiful allegory or a symbolic representation that Jesus Himself shared to explain the need for our dependency on God. Jesus is the vine; we are the branches; Father God is the gardener and not to forget the Holy Spirit - the sap inside the branches that helps it being connected to the branch. Praise the Lord! We will be meditating on the same passage for the next couple of days. Be sure to join the conversation. For today just remember - Jesus is the true vine. May God bless you and have a wonderful Monday! Come, let us give praises to God Almighty today - lots and lots of them! So, how do we walk humbly with the Lord? I guess this comes with maturity. As we grow more and more in Christ we become less and less significant in our sight. Happy weekend ahead! Coffee with Jesus will be served on the weekend too; so join us if you can. God bless you! The same question is directed towards us today. How merciful are we? Do we love mercy? Shouldn’t we have mercy on our fellow men just as our Lord Jesus has had on us? Have a blessed week ahead. God be with you! I am a sky gazer. I love looking at the skies. Looks like King David did too. He has beautiful reflections on God Almighty looking at the skies. If you don't normally care for the skies, please take a moment to gaze it next time you are out. You too will be able to reflect on the Creator. We will become so insignificant in the vast expanse of the skies. The more insignificant we get, the more significant He gets! It is an awesome experience folks; care to try?! I would often think I had no enemies only to realize that not everyone I know of think of my well being all the time. There would be jealousy, hatred & grudges against us from very familiar people. They may not be genuinely happy when things go well for us and may secretly rejoice when things go bad for us, thus becoming an "enemy". Also, not to forget our real enemy - the roaring lion prowling around looking to devour someone. Dear Father in Heaven, thank you Lord for this beautiful day. Thank you for this wonderful time with you Lord. Thank you for always preparing a table for us in front of our enemies in the past circumstances Lord. Thank you for always lifting up our heads and anointing us with the oil of joy Lord. Thank you that you gave us in abundance that our cup ran over Lord. We continue to trust that your glory will be revealed in the coming days too Lord. Thank you for your protection and for your anointing Lord. We praise you again for all your mercies Lord. Bless this day Lord. Bless each and every one of us gathered here to spend few minutes with you Lord. We Love you Jesus! In Jesus' mighty name we pray, Amen! Asking we understand. Seeking we understand. But knocking? Knocking what? I assume it is knocking when we shut ourselves out of the presence of the Lord. His heart is always open. He assures in Revelation 3:8 "I have placed before you an open door that no one can shut." Then there are times we can sense all the doors are shut when an answer to our prayers is delayed. Those are the times we actually knock. We knock so that God reveals the open doors to us. We knock to enter back into His joyful presence. And, we open to Him who knocks at our shut hearts. May God bless you and make this promise come true in your life. Praise the Lord! Ask. Seek. Knock. Keep on asking, seeking & knocking. Seek Him continually! That is the message for us this morning! Above Scriptures clearly explain the benefits of seeking His face. What does it mean to seek someone/something? * To make a search or investigation. Seek God. Then you will find Him. Seek Him continually. Till you find Him! Amen! Prayer or asking God for something, especially for the infilling of the Holy Spirit is not a one time thing. We pray persistently. We keep on asking. Clearly Jesus encourages us to pray, pray often, pray day in and day out, pray constantly. Shall we? Prayer is the appointed means for obtaining what we need. Pray; pray often; make a business of prayer, and be serious and earnest in it. Ask, as a beggar asks alms. Ask, as a traveller asks the way. Seek, as for a thing of value that we have lost; or as the merchantman that seeks goodly pearls. Knock, as he that desires to enter into the house knocks at the door. Sin has shut and barred the door against us; by prayer we knock. Whatever you pray for, according to the promise, shall be given you, if God see it fit for you, and what would you have more? This is made to apply to all that pray aright; every one that asketh receiveth, whether Jew or Gentile, young or old, rich or poor, high or low, master or servant, learned or unlearned, all are alike welcome to the throne of grace, if they come in faith. It is explained by a comparison taken from earthly parents, and their readiness to give their children what they ask. Parents are often foolishly fond, but God is all-wise; he knows what we need, what we desire, and what is fit for us. Let us never suppose our heavenly Father would bid us pray, and then refuse to hear, or give us what would be hurtful. Have a blessed day! Don't forget to ask, seek & knock. Shalom is a regular greeting among the Jews, very similar to our usage of 'Hello, how are you?'. These salutations and benedictions are generally matters of custom and polite ceremony, given without much thought to it. However here the Prince of Peace is not talking mere empty words but brings the attention to the word PEACE as in consolation. When He says 'my peace' He means the kind of peace only He can impart. This promised peace is very different from the empty promises given by the world. When we are at peace it gives us a tranquil spirit. We are not in a rush to find a solution for matters. We learn to unwind at His feet and be still. We completely surrender for His will. Have you sensed this peace lately? Have a blessed weekend folks! The Lord's peace be with you! Christian - the lead character in the book, is on a journey - from the City of Destruction to the Celestial City. Christian is weighed down by a great burden, the knowledge of his sin, which he believed came from his reading "the book in his hand", (the Bible). 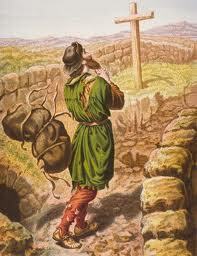 This burden, which would cause him to sink into Tophet (hell), is so unbearable that Christian must seek deliverance. He meets Evangelist as he is walking out in the fields, who directs him to the "Wicket Gate" for deliverance. After some waywardness Christian finally reaches the "place of deliverance" (allegorically, the cross of Calvary and the open sepulcher of Christ), where the "straps" that bound Christian's burden to him break, and it rolls away into the open sepulchre. The point of focus for our discussion is, when we lose our burden of sin and guilt at the cross, we pick up a lighter load and continue on the journey. This lighter load indicates the teachings of the Scriptures, the areas in which we need to improve, loving, forgiving, etc to become more like Jesus every day. Compared to our original bundle of sin, this yoke is very light and not a difficult task at hand. Might seem so at times but by His grace we can do it! Amen! Praise the Lord! Happy Friday! As we wrap up the week we are also wrapping up our series on Grace & Peace. Taking the time or waiting on the Lord does not come naturally to us. We would rather take matters in our own hands than "sit around", we reason. From Abraham to Moses to Peter to even us, all have history of impatience and we have seen the consequences of that. Happy June everyone! A new month is a new beginning - full of hope is it not? Let us start the month with renewed mind and a refreshed Spirit.